ConferenceSeries Ltd invites all the participants across the globe to attend the "International Conference on Oral, Mouth and Throat Cancer” slated on August 15-17, 2016 in Portland, USA which includes prompt Keynote presentations, Oral talks, Poster presentations and Exhibitions. OMTC 2016 is a global platform to discuss and learn about Pathophysiology of Oral Cancer, Mouth Cancer, Throat Cancer, Head and Neck Cancer, Causes of Oral Cancer, Stages in Oral Cancer, Pathogenesis in Oral Cancer, Clinical and Diagnostics of Oral Cancer, Surgical Methods in Oral Cancer Treatment, Non-Surgical Methods in Oral Cancer Treatment, Prevention of Oral Cancer, Complications in Oral Cancer Treatment, Oral Oncologists Meetings. The term oral cancer includes cancers of the mouth cancer and the pharynx. Several types of tissue make up the mouth and oropharynx. Each tissue consists of several types of cells. Cancer can develop from any of these cell types. It is important to know what kind of cancer and how it is treated. More than 9 out of 10 mouth and oropharyngeal cancers are squamous cell carcinoma. 12th Cancer Conferences Europe September 26-28, 2016 London, UK, Cancer Global Conferences Middle East November 21-23, 2016 Dubai, UAE, 12th Oncology Conferences September 25-28, 2016 London, UK, Worldwide Cancer Events November 21-23, 2016 Dubai,UAE,12th Cancer Science Events Europe September 26-28, 2016 London, UK; Oncology Conferences November 21-23, 2016 Dubai, UAE. Mouth cancer can appear as a painless mouth ulcer that does not heal normally. A white or red patch in the mouth can also develop into a cancer. Alcohol increases the risk of mouth cancer, and if tobacco and alcohol are consumed together the risk is even greater. Over-exposure to sunlight can also increase the risk of cancer of the lips. Most cases of mouth cancer are linked to tobacco and alcohol. Cigarette, cigar and pipe smoking are the main forms of tobacco use in many parts of the world. However, the traditional habits in some cultures of chewing tobacco, betel quid, gutkha and paan are particularly dangerous. International Conference on Speech-Language Pathology, November 14-15, 2016 Atlanta, USA; International Conference on Pathology; 2nd International Conference on Cytopathology, August 11-12, 2016 Birmingham, UK; International Conference on Thyroid Disorders and Treatment, February 29-March 02, 2016 Philadelphia, USA; 5th International Conference on Radiology and Imaging, September 19-20, 2016 Las Vegas, USA; AEEDC Dubai Conference on Oral/Maxillofacial Surgery, 2016 Conference Feb 2-4, 2016 Dubai; 7th European Conference on Head/Neck Oncology (ECHNO), April 27-30, 2016 Istanbul, Turkey; Oral Dermatology and Pathology Conference Mediterranean Cruise, October 28 - November 4, 2016 Barcelona, Spain; 85th Annual Meeting of the American Thyroid Disorders Association, September 21–25 2016 Denver, United States; Global Oral Cancer Conference Forum March 4-5th, 2016 New York City, USA. Throat cancer refers to cancerous tumours that develop in your throat (pharynx), larynx or tonsils. Cancer is a class of diseases in which abnormal cells multiply and divide uncontrollably in the body. These abnormal cells form malignant growths called tumors. Throat cancer refers to cancer of the voice box, the vocal cords, and other parts of the throat, such as the tonsils and the oropharynx. Throat cancer is often grouped into two categories: pharyngeal cancer, which forms in the pharynx and laryngeal cancer, which forms in the larynx. International Conference on Thyroid Disorders and Treatment, February 29-March 02, 2016 Philadelphia, USA; 2nd International Exhibition and Conference on Molecular Medicine and Diagnostics, September 26-28, 2016 Miami, USA; 16th Euro Congress on Dental & Oral Health, October 24-26, 2016 Rome, Italy; 17th Asia-Pacific Dental and Oral Care Conference , November 7-9, 2016 Melbourne, Australia; International Symposium on Head,Neck tumours, October 3-4 2015 , T M A Pai, Conference Hall, Manipal University; Cancer Pathophysiology Conference: Integrating the Host and Tumor Environments, March 28 - April 1, 2016 Colorado, USA; AEEDC Dubai Oral/Maxillofacial Surgery Conference, February 2-4, 2016 Dubai; 38th Oral/ Maxillofacial Pathology Conference, January 9-15 Orlando, USA; 85th Annual Meetings on Thyroid Disorders , September 21–25 2016 Denver, United States. Cancers that are known collectively as head and neck cancers usually begin in the squamous cells that line the moist, mucosal surfaces inside the head and neck. These squamous cell cancers are often referred to as squamous cell carcinomas of the head and neck. The two most important risk factors for head and neck cancers, especially cancers of the oral cavity, oropharynx, hypopharynx, and larynx. At least 75% of head and neck cancers are caused by tobacco and alcohol use. Infection with cancer-causing types of human papillomavirus (HPV), especially HPV-16 is a risk factor for some types of head and neck cancers, particularly oropharyngeal cancers that involve the tonsils or the base of the tongue. Global Summit and Medicare Conference on Head/ Neck Surgery, November 30-December 01, 2015 Atlanta, Georgia, USA; 85th Annual Meeting of the Thyroid Cancer, September 21–25 2016 Denver, United States; 4th Head/ Neck Surgery Conference, December 1-2, 2015 Atlanta, Georgia, USA; 5th International Conference on Radiology and Imaging, September 19-20, 2016 Las Vegas, USA; Hands on Transoral Laser Microsurgery for Head/Neck Cancer Conference, October 10-11, 2016 Memorial Sloan Kettering Cancer Center, New York; 7th European Conference on Head/Neck Oncology (ECHNO), April 27-30, 2016 Istanbul, Turkey; AHNS 9th International Conference on Head/Neck Cancer, July 16-20, 2016 Seattle, Washington; Skin Cancer of the Head,Neck, May 16, 2017 Utrecht, Netherlands. Most cases of oral cancer are because of cigarette smoking, heavy alcohol use or the use of both tobacco and alcohol consumptions. Using tobacco plus alcohol poses a much greater risk than using either substance alone. HPV Infection with the sexually transmitted human papillomavirus has been linked to a subset of oral cancers. Cancer of the lip can be caused by sun exposure. A low nutrient diet because of fewer intakes of fruits and vegetables may play a role in oral cancer development. Risk increases with age. Oral cancer most often occurs in people over the age of 40. 16th Euro Conference on Oral Health & Dental, October 24-26, 2016 Rome, Italy; 17th Asia-Pacific Dental and Oral Care Conference, November 7-9, 2016 Melbourne, Australia; 7th International Conference and Exhibition on Dentistry & Oral Care, April 18-20, 2016 Dubai, UAE; 4th International Conference on Blood Malignancies and Treatment, April 18-20, 2016 Dubai, UAE; 5th International Conference on Radiology and Imaging, September 19-20, 2016 Las Vegas; International Federation of Head, Neck Oncologic Societies, September 1-5, 2018 Buenos Aires, Argentina; 18th International Conference on Oral Pathology and Oral Dermatology, January 25 - 26, 2016 Istanbul, Turkey; International Conference on Oral Pathology, September 8-11 Chennai; 23rd Annual International Symposium in Oral, Maxillofacial Surgery, January 25-29, Kauai. The stage of oral cancer is one of the most important factors in evaluating treatment options. A stage 0 oral cancer tumor means the cancer is only growing in the epithelium which is the outermost layer of tissue in the oral cavity. A stage I oral cancer tumor means the primary tumor is 2 cm across or smaller and no cancer cells are present in nearby structures, lymph nodes or distant sites. A stage II oral tumor measures 2-4 cm across and no cancer cells are present in nearby structures, lymph nodes or distant sites. The oral tumor is larger than 4 cm across and no cancer cells are present in nearby structures, lymph nodes or distant sites is stage III. Stage IV is the tumor has invaded deeper areas and/or tissues. It may or may not have spread to lymph nodes and has not spread to distant sites. Recurrent or relapsed disease means that the cancer has returned after treatment. Recurrent disease does not have a TNM classification or a staging system number. TNM system is a commonly accepted method based on three key components Tumor, Node and Metastasis. 5th International Conference on Radiology and Imaging, September 19-20, 2016 Las Vegas, USA; International Conference on Radiography, November 17-18, 2016 Dubai, UAE; 4th Global Radiologists Annual Meeting, March 17-18, 2016 London, UK; International Conference on Thyroid Cancer and Treatment, August 1-3, 2016 Toronto, Canada; 2nd International Conference and Exhibition on Molecular Medicine and Diagnostics, September 26-28, 2016 Miami, USA; European River Cruise Seminar, October 14-21, 2016 Budapest, Germany; 18th International Conference on Oral Surgery, Medicine and Radiology, August 8-9, 2016 Venice, Italy; 2016 World Cancer Congress Paris, France; 85th Annual Meeting of the Conference on Thyroid Cancer, September 21–25 2016 Denver, United States. All types of carcinomas are seen in oral cavity, the most common form of OC is squamous cell carcinoma. Use of genetic and proteomic approach in recent years have revealed the molecular pathology picture of Oral Cancer. Genetic alterations define molecular basis of carcinogenesis which includes point mutations, amplifications, rearrangements and deletions. Several oncogenes have also been implicated in oral carcinogenesis. Genomic instability such as loss of hetrozygosity and microsatellite instability are frequently observed in cancer and such instability has been investigated and several reports are available in Oral Cancer. 5th Global Pathologists Annual Meeting, September 29 - October 01, 2016 London, UK; World Digital Pathology Congress, October 31-November 02, 2016 Valencia, Spain; 5th International Conference and Exhibition on Pathology, May 09-11, 2016 Chicago, USA; 2nd International Conference on Cytopathology, August 11-12, 2016 Birmingham, UK; International Conference on Speech-Language Pathology, November 14-15, 2016 Atlanta, USA; 38th Annual Oral & Maxillofacial Pathology, Reconstructive & Medicine Review, January 9-15, 2016 Walt Disney World Dolphin, Florida; 18th International Conference on Oral Surgery, August 8-9, 2016 Venice, Italy; 85th Annual Meeting of the American Thyroid Association, September 21–25 2016 Denver, United States; Oral Dermatology and Pathology Maediterranean Cruise, October 28 - November 4, 2016 Barcelona, Spain; 23rd Annual International Symposium in Oral, Maxillofacial Surgery, January 25-29, 2016 Kauai. The goal of oral cancer screening is to identify mouth cancer early, when there is a greater chance for a cure. The patient will undergo a thorough examination of the head and neck to look for lesions and abnormalities. A mirror exam and/or an indirect laryngoscopy will most likely be done to view areas that are not directly visible on examination. Tests are done to know whether it is a Cancer mimic or not. Salivary diagnostics are also done to test for Oral Cancer. PET scan is another diagnostic tool in which, a form of radioactive sugar is injected into the blood. Because cancer cells use glucose at a higher rate than normal cells, they will absorb more of the radioactive sugar and the radioactivity will to concentrate in the cancer. Cancer Diagnostics Conference & Expo, June 13-15, 2016 Rome, Italy; 2nd International Conference and Exhibition on Molecular Medicine and Diagnostics, September 26-28, 2016 Miami, USA; 4th International Conference on Predictive, Preventive and Personalized Medicine & Molecular Diagnostics, September 19-21, 2016 Phoenix, USA; 2nd International Conference and Exhibition on Molecular Medicine and Diagnostics, September 26-28, 2016 Miami, USA; International Conference on Thyroid Cancer and Treatment, August 1-3, 2016 Toronto, Canada; 2016 World Cancer Congress Paris, France; 18th International Conference on Oral Dermatology and Oral Pathology, January 25-26, 2016 Istanbul, Turkey; AEEDC Dubai World Oral and Maxillofacial Surgery 2016 Conference, February 2-4, 2016 Dubai; Global Oral Cancer Conference, March 4-5th, 2016 New York City, USA; Oral Dermatology and Pathology Maediterranean Cruise, October 28-November 4, 2016 Barcelona, Spain. Depending on the stage of Oral Cancer the type of surgery is recommended. Tumor resection is an operation to remove the entire tumor. Some normal tissue surrounding the tumor is also removed to ensure that no cancer cells remain in the body. Mohs micrographic surgery is a tumor removed in very thin slices, with each slice examined under the microscope for the presence of cancer cells. Full or partial mandible (jawbone) resection when a tumor has grown into the jawbone, a mandibular resection or mandibulectomy, may be needed. Glossectomy is type of cancer surgery, which involves removal of the tongue, is used to treat cancers of the tongue. Maxillectomy is the operation removes all or part of the hard palate, the front of the roof of the mouth. Laryngectomy is the surgical oncology procedure involves removing the voice box along with the primary tumor. Neck dissection is the type of oral cancer surgery is used to remove lymph nodes in the neck if cancer has spread to this area. International Conference and Exhibition on Surgical Oncology, September 01-03, 2016 Sao Paulo, Brazil; Global Summit and Medicare Expo on Head & Neck Surgery, November 30-December 01, 2016 Atlanta, Georgia, USA; 4th International Conference and Exhibition on Surgery, October 05-07, 2015 Crowne Plaza, Dubai, UAE; 4th Global Radiologists Annual Meeting, March 17-18, 2016 London, UK; 5th International Conference on Radiology Imaging, September 19-20, 2016 Las Vegas, USA; 85th Annual Meeting of the American Thyroid Association, September 21–25 2016 Denver, United States; Austrian Society Of Oral And Maxillofacial Surgery 20th Annual Congress, January 26-29, 2016 Bad Hofgastein; 23rd Congress of the European Conference on Cranio Maxillo-Facial Surgery, September 13-16, 2016 London, UK; 4th International Conference and Exhibition on Surgery, October 05-07, 2016 UAE, Dubai; Oral Dermatology Conference and Pathology Maediterranean Cruise, October 28 - November 4, 2016 Barcelona, Spain. Radiation therapy may be the main treatment for oral cavity cancer or it can be used after surgery to destroy small areas of cancer that could not be removed. Chemotherapy is the use of drugs to destroy cancer cells usually by stopping the cancer cells’ ability to grow and divide. Radio Immunotherapy also called biologic therapy is designed to boost the body’s natural defenses to fight cancer. Targeted therapy is a treatment that targets the cancer’s specific genes, proteins or the tissue environment that contributes to cancer growth and survival. Cancer and its treatment often cause side effects. In the process of cancer treatment, it is an important part to take care a person’s adverse effects caused by the anti-cancer therapy with suitable medication. This approach is called palliative or supportive care, and it includes supporting the patient with his or her physical, emotional and social needs. A remission is when cancer cannot be detected in the body and there are no symptoms. This may also be called “no evidence of disease”. 2nd International Conference on Chemotherapy and Antimicrobial Agents, June 06-07, 2016 Dallas, USA; International Conference on Nuclear Medicine & Radiation Therapy, July 14-15, 2016 Cologne, Germany; International Conference on Radiography, November 17-18, 2016 Dubai, UAE; 5th International Conference on Radiology and Imaging, September 19-20, 2016 Las Vegas, USA; 4th Global Radiologists Annual Meeting, March 17-18, 2016 London, UK; 38th Annual Oral & Maxillofacial Pathology, Reconstructive & Medicine Review, January 9-15, 2016 Walt Disney World Dolphin, Florida; 15th European Congress of Dento MaxilloFacial, Radiology June 15-18, 2016 Cardiff, Wales; 5th Trends in Head, Neck Oncology Conference, November 5-7 2015 Lissabon, Portugal; 18th International Conference on Oral Dermatology and Oral Pathology, February 25-26, 2016 London, United Kingdom; 85th Meeting on American Thyroid Association, September 21–25 2016 Denver, United States. It is a sort of action to stop cancer from occurrence or arising. Different ways to prevent cancer are changing lifestyle, eating habits, avoiding things known to cause cancer and Taking medication to treat a precancerous condition. Regular health check-ups can also prevent cancer. Even some times Family History or hereditary also plays an important role in preventing the cancer. International Conference on Radiography, November 17-18, 2016 Dubai, UAE; International Conference on Thyroid Cancer and Treatment, August 1-3, 2016 Toronto, Canada; 5th International Conference on Radiology and Imaging, September 19-20, 2016 Las Vegas, USA; 2nd International Conference and Exhibition on Molecular Medicine and Diagnostics, September 26-28, 2016 Miami, USA; International Conference on Radiography, November 17-18, 2016 Dubai, UAE; ESMO Sarcoma & GIST Conference, February 16-18, 2016 Milan, Italy; Antibodies as Drugs: Immunological Scaffolds as Therapeutics, February 8-13, 2016 Banff, Canada; Noncoding RNAs in Health and Disease, February 21-24, 2016 New Mexico, USA; 6th International Conference on Stem Cells and Cancer Proliferation, Differentiation and Apoptosis, October 2-5,2015 Pune, India; Oral Dermatology and Pathology Mediterranean Cruise, October 28 - November 4, 2016 Barcelona, Spain. Complications of cancer treatment may vary with the degrees of severity, depending on the individual and the cancer treatment. Chemotherapy often impairs the function of bone marrow, suppressing the formation of white blood cells, red blood corpuscles and platelets. Some cancer treatments are described as stomatotoxic because they have lethal effects on the oral tissues. Infections like Viral, bacterial and fungal results from myelosuppression, xerostomia or damage to the mucosa from chemotherapy & radiotherapy. There may be a risk of rampant dental decay throughout the life which may begin within 3 months of completing oral cancer treatment, is nothing but either the quality or quantity of saliva persists. International Conference on Radiography, November 17-18, 2016 Dubai, UAE; International Conference on Thyroid Cancer and Treatment, August 1-3, 2016 Toronto, Canada; 5th International Conference on Radiology and Imaging, September 19-20, 2016 Las Vegas, USA; 2nd International Conference and Exhibition on Molecular Medicine and Diagnostics, September 26-28, 2016 Miami, USA; International Conference on Radiography, November 17-18, 2016 Dubai, UAE; Antibodies as Drugs: Immunological Scaffolds as Therapeutics Conference, February 8-13, 2016 Banff, Canada; Noncoding RNAs in Health and Disease Conference, February 21-24, 2016 New Mexico, USA; 6th International Conference on Stem Cells and Cancer Proliferation, Differentiation and Apoptosis, October 2-5,2015 Pune, India; Conference on Oral Dermatology and Pathology Mediterranean Cruise, October 28 - November 4, 2016 Barcelona, Spain. Otorhinolaryngology is the area of medicine that deals with disorders conditions of the ear, nose, and throat region, and related areas of the head and neck. 2nd International Conference on Chemotherapy and Antimicrobial Agents, June 06-07, 2016 Dallas, USA; International Conference on Nuclear Medicine & Radiation Therapy, July 14-15, 2016 Cologne, Germany; International Conference on Radiography, November 17-18, 2016 Dubai, UAE; 5th International Conference on Radiology and Imaging, September 19-20, 2016 Las Vegas, USA; 4th Global Radiologists Annual Meeting, March 17-18, 2016 London, UK; 38th Annual Oral & Maxillofacial Pathology, Reconstructive & Medicine Review, January 9-15, 2016 Walt Disney World Dolphin, Florida; 15th European Meetings on Dento Maxillofacial, Radiology June 15-18, 2016 Cardiff, Wales; 18th International Conference on Oral Dermatology and Oral Pathology, February 25-26, 2016 London, United Kingdom; 85th Annual Meeting of the American Thyroid Association, September 21–25 2016 Denver, United States. Dentistry is a branch of medicine that is involved in the study, diagnosis, prevention, and treatment of diseases, disorders and conditions of the oral cavity, commonly in the dentition but also the oral mucosa, and of adjacent and related structures and tissues, particularly in the maxillofacial area. 85th Annual Meeting of the American Thyroid Association September 21–25 2016 Denver, United States; 4th Head & Neck Surgery Conference December 1-2, 2015 Atlanta, Georgia, USA; 5th International Conference on Radiology and Imaging September 19-20, 2016 Las Vegas, USA; 7th European Conference on Head and Neck Oncology (ECHNO) 27-30 April 2016 Istanbul, Turkey; AHNS 9th International Conference on Head & Neck Cancer 16-20 July 2016 Seattle, Washington; Skin Cancer of the Head and Neck, May 16 2017 , Utrecht Netherlands; 39th Annual Meeting of the European Thyroid Association September 03 - 07, 2016 Copenhagen, Denmark. Oral Cavity Cancer is associated with high incidence of loco-regional recurrences, which account for the majority of treatment failures post-surgery and radiotherapy. The time-course of relapse manifestation and metastasis are unpredictable. Relapsed OCC represents a major clinical challenge in part due to their aggressive and invasive behaviors. Chemotherapy remains the only option for advanced OCC whenever salvage surgery or re-irradiation is not feasible, but its efficacy is limited as a result of the drug resistance development. Alternatives to use of different permutations of standard cytotoxic drugs or combinations with modulators of drug resistance have led to incremental therapeutic benefits. The introduction of targeted agents and biologics against selective targets that drive cancer progression has opened-up optimism to achieve superior therapeutic activity and overcome drug resistance because, unlike the non-selective cytotoxic, the target can be monitored at molecular levels to identify patients who can benefit from the drug. This review discusses the multifactorial aspects of clinical drug resistance and emerging therapeutic approaches in recurrent OCC, emphasizing recent advances in targeted therapies, immunotherapy, and potential relevance of new concepts such as epithelial-mesenchymal transition and cancer stem cell hypothesis to drug resistance. International Conference on Radiography, November 17-18, 2016 Dubai, UAE; International Conference on Thyroid Cancer and Treatment, August 1-3, 2016 Toronto, Canada; 5th International Conference on Radiology and Imaging, September 19-20, 2016 Las Vegas, USA; 2nd International Conference and Exhibition on Molecular Medicine and Diagnostics, September 26-28, 2016 Miami, USA; International Conference on Radiography, November 17-18, 2016 Dubai, UAE; Immunological Scaffolds as Therapeutics, February 8-13, 2016 Banff, Canada; Noncoding RNAs in Health and Disease Conference, February 21-24, 2016 New Mexico, USA; 6th International Conference on Stem Cells and Cancer Proliferation, Differentiation and Apoptosis, October 2-5,2015 Pune, India; Conference on Oral Dermatology and Pathology Mediterranean Cruise, October 28 - November 4, 2016 Barcelona, Spain. Oral biology is that area of knowledge that deals with the structure, development, and function of the oral tissues, their interrelationships and their relation to other organ systems in both health and disease. 2nd International Conference on Chemotherapy and Antimicrobial Agents, June 06-07, 2016 Dallas, USA; International Conference on Nuclear Medicine & Radiation Therapy, July 14-15, 2016 Cologne, Germany; International Conference on Radiography, November 17-18, 2016 Dubai, UAE; 5th International Conference on Radiology and Imaging, September 19-20, 2016 Las Vegas, USA; 4th Global Radiologists Annual Meeting, March 17-18, 2016 London, UK; 38th Annual Oral & Maxillofacial Pathology, Reconstructive & Medicine Review, January 9-15, 2016 Walt Disney World Dolphin, Florida; 15th European Congress of Dento MaxilloFacial, Radiology June 15-18, 2016 Cardiff, Wales; 5th Advances in Head and Neck Oncology, November 5-7 2015 Lissabon, Portugal; 18th International Conference on Oral Dermatology and Oral Pathology, February 25-26, 2016 London, United Kingdom; 85th Annual Meeting of the American Thyroid Association, September 21–25 2016 Denver, United States. Oral & Maxillofacial Surgery specializes in treating many diseases, injuries and defects in the head, neck, face, jaws and the hard and soft tissues of the Oral and Maxillofacial region. It is an internationally recognized surgical specialty. In some countries around the world, including the United States, Canada and Australia, it is a recognized specialty of dentistry in others, such as the UK and most of Europe, it is recognized as both a specialty of medicine and dentistry and a dual degree in medicine and dentistry is compulsory. 2nd International Conference on Chemotherapy and Antimicrobial Agents, June 06-07, 2016 Dallas, USA; International Conference on Nuclear Medicine & Radiation Therapy, July 14-15, 2016 Cologne, Germany; International Conference on Radiography, November 17-18, 2016 Dubai, UAE; 5th International Conference on Radiology and Imaging, September 19-20, 2016 Las Vegas, USA; 4th Global Radiologists Annual Meeting, March 17-18, 2016 London, UK; Global Cancer: Occurrence, Causes, And Avenues To Prevention, June 7-10, 2016 Lyon, France; International Conference on Oral Pathology, September 8-11 Chennai; AHNS 9th International Conference on Head & Neck Cancer, July 16-20, 2016 Seattle, Washington; 38th Annual Oral & Maxillofacial Pathology, January 9-15 Orlando, USA; 6th IFHNOS World Congress, September 1-5, 2018 Buenos Aires, Argentina. This session is designed to share important information and latest advancements in Oral Cancer Treatment and the issues with Oral Oncology. 17th Asia-Pacific Dental and Oral Care Congress, November 7-9, 2016 Melbourne, Australia; 7th International Conference on Dentistry & Oral Care, April 18-20, 2016 Dubai, UAE; 4th International Conference on Blood Malignancies and Treatment, April 18-20, 2016 Dubai, UAE; 5th International Conference on Radiology and Imaging, September 19-20, 2016 Las Vegas; International Federation of Head and Neck Oncologic Societies, September 1-5, 2018 Buenos Aires, Argentina; Oral Dermatology and Pathology Maediterranean Cruise, October 28 - November 4, 2016 Barcelona, Spain; 18th International Conference on Oral Pathology and Oral Dermatology, January 25 - 26, 2016 Istanbul, Turkey; International Conference on Oral Pathology, September 8-11 Chennai; 23rd Annual International Symposium in Oral and Maxillofacial Surgery, January 25-29, Kauai. ConferenceSeries Ltd invites all the participants from all over the world to attend 'International Conference on Oral, Mouth and Throat Cancer' during August 15-17, 2016 in Portland, USA which includes prompt Keynote presentations, Oral talks, Poster presentations and Exhibitions. OMTC 2016 directs towards addressing main issues as well as future approaches of Oral Cancer. This is going to be the largest and most auspicious international conference where the program includes discussions and debate on various aspects of the Oral Cancer, risks and real research work and complete evidence of Oral Oncology. 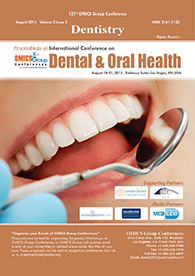 This conference deals with the unique techniques to treat Oral Cancer and its innovative strategies. The event is a three day program and the conference theme is “Awareness, Early Detection, Prevention and Treatment of Oral Cancer” and hence we are seeking a support of innovative ideas which forms the ambiance of our Medical meetings. With members from around the world focused on learning about Oral Cancer and its advances in treatment; this is your best opportunity to reach the largest assemblage of participants from the Oral Oncology community. Conduct presentations, distribute information, meet with current and potential scientists, make a splash with new drug developments, and receive name recognition at this 3-day event. World-renowned speakers, the most recent techniques, developments, and the newest updates in Oral Cancer are hallmarks of this conference. Oral Cancer is the growth of abnormal cells in any part of the mouth or lips. Most oral cancers start in the lining of the lips or mouth where you have thin, flat cells called squamous cells.This type of cancer is also called as oral cavity cancer or oropharyngeal cancer. Oral cancer is the tenth most common cancers worldwide. Oral cancer is the sixth most common cancer among men.An estimated 263,900 new cases and 128,000 deaths from oral cavity cancer (including lip cancer) occurred in worldwide.The highest oral cavity cancer rates are found in Melanesia, South-Central Asia, Central Eastern Europe, the lowest Africa, Central America, and Eastern Asia for both males and females. Smoking, alcohol use, smokeless tobacco products and HPV infections are the major risk factors for oral cavity cancer. Worldwide, smoking accounts for 42% of deaths from cancers of the oral cavity (including the pharynx) and heavy alcohol consumption for 16% of the deaths; the corresponding percentages in high-income countries are about 70% and 30%, respectively. Smokeless tobacco products and betel quid with or without tobacco are the major risk factors for oral cavity cancer.There are more than 3,500 new cases of Oral Cancer each year. In recent years, the overall rate of new cases of this disease has been stable in men and dropping slightly in women. The death rate for Oral cancer has been decreasing over the last 30 years.The average age of most people diagnosed with these cancers is 62, but they can occur in young people. They are rare in children, but a little more than one-quarter occur in patients younger than 55. The rates of this Oral Cancer vary among countries. When patients newly diagnosed with oral and oropharyngeal cancers are carefully examined, a small portion will have another cancer in a nearby area such as the larynx (voice box), the esophagus, or the lung. Some who are cured of oral or oropharyngeal cancer will develop another cancer later in the lung, mouth, throat, or other nearby areas. For this reason, patients with oral and oropharyngeal cancer will need to have follow-up exams for the rest of their lives. They also need to avoid using tobacco and alcohol, which increase the risk for these second cancers. Oral Oncology is the major health problem in USA. The major Oral Cancer cases are seen in poor population groups. According to the statistics seen through years one in six men and one in seven women will get cancer during their lives. In US, a few studies have been reported on the patterns and aetiology of oral cancer and age standardised incidence rates. Studies in several countries have shown an increase in oral cancer incidence among young aged people. The current patterns of oral disease reflects distinct risk profiles across US related on the living conditions, lifestyles and environmental factors of the area, for the implementation of oral health schemes. The death rate due to Oral Cancer is 5.83 per 10,000. Oral Oncology is the major health problem . The major Oral Cancer cases are seen in poor population groups. In USA a few studies have been reported on the patterns and aetiology of oral cancer and age standardised incidence rates. Studies in several countries have shown an increase in oral cancer incidence among young aged people. The current patterns of oral disease reflects distinct risk profiles across United States related on the living conditions, lifestyles and environmental factors of the area, for the implementation of oral health schemes. The death rate due to Oral Cancer is 5.83 per 10,000. It stands 24th rank in all over the world. The market for head and neck cancer diagnostics is expected to increase year on year correlating with rising incidence of the disease in most regions. Demographically, Africa and Asia-Pacific along with parts of Europe and certain regions in South America have the highest incidences of head and neck cancer these regions are prone to higher intake of alcoholic and tobacco products. In Asia-Pacific, Africa, India, China and South Africa are the biggest markets for head and neck cancer diagnostics. Some of the major trends driving the market are rise in incidence of target diseases, growing geriatric population worldwide and better healthcare initiatives by governments and various private organizations. An increase in the amount of disposable incomes in many regions across the globe is an opportunity that the market can capitalize on and expand. Global Data expects the global head and neck cancer market to grow at 8.3% annually for the next seven years to reach $1,809m by 2016. It was valued at$1,035m in 2009. This report explains the market growth and forecasts for the head and neck cancer. Geographical segmentation and market size estimation are also included in the study. The key drivers, restraints and opportunities have been incorporated to the study and a competitive analysis for the market has been captured. The market size estimates have been forecasted to the year 2020 for both the global and regional markets. With the advent of novel and innovative technologies, industries like healthcare and pharmaceutical are scaling newer heights. One such market is the oncology market. With global oral cancer incidences rising to almost 14.1 Million in 2012 and several blockbuster cancer drugs losing their patent protection, the market for cancer generics is bound to experience skyrocketing growth. According to this latest research report Market Outlook 2018, the global oral oncology market touched a mark of US$ 91 Billion in 2013 and is poised to grow at a CAGR of approximately 6% over the next 5 year period. On the other hand, the market for cancer generics is expected to grow at 12%, reaching US$(dollars) 21 Billion by 2018. Patent expiry, low cost, and better life expectancy would be the major boosting factors for the cancer generics industry. 11. Products manufactured by the industry related Oral Cancer Research and its market Value. The Fund allotment in Oral Cancer research is 495$ in South Africa, 195$ in Cape Town and 800$ in all over the World. OMICS Group’s 5th Asia-Pacific Summit on Cancer Therapy at Park Regis Brisbane, Australia during July 20-22, 2015 was organized with a focus on "Forum for a world without cancer” was a great success where eminent keynote speakers from various reputed institutions made their resplendent presence and addressed the gathering. Cancer Summit-2015 witnessed an amalgamation of peerless speakers who enlightened the crowd with their knowledge and confabulated on various newfangled topics related to the field of cancer. Cancer Summit-2015 Organizing Committee would like to thank the Moderator of the conference, Dr. Rupinder Kaur Kanwar, Deakin University, K who contributed a lot for the smooth functioning of this event. OMICS Group, on behalf of the conference, congratulates the Best Poster awardees for their outstanding performance and appreciates all the participants who put their efforts in poster presentations and sincerely wishes them success in future endeavors. We would like to thank the Poster Competition Judge Dr. Izhak Haviv, Bar Ilan University, Israel for his valuable time. OMICS Group also took the privilege of felicitating Cancer Summit-2015 Organizing Committee, Editorial Board Members of Journals of Cancer Science & Therapy, Journal of Carcinogenesis & Mutagenesis and Journal of Integrative Oncology, Keynote Speakers, Chair and Co-Chairs and Moderator whose support made conference a great success. Over thousands of scholars from the field of Chemotherapy stepped away from their nations last Tuesday, August 2nd, 2015to take part in an ostentatious event “International Conference on Antimicrobial Agents and Chemotherapy” August 04-06, 2015, in Valencia, Spain. The conference was organized around a single theme “Emerging techniques and advancements in the field of chemotherapy” which comprised of 06 tracks with knowledge oriented presentations igniting young minds in the crowd. The Conference provided a rostrum for interaction among keynotes, chair & co-chairs, plenary speakers, poster presentees, young research fellows & delegates and to share their experiences, ideas & research, thus helping to generate a new way of looking at Cancer treatments. Dr. Emil Toma, University of Montreal, USA. Dr. Didier Coquoz, Copexis, Switzerland. Dr. Hiroyuki Osada, RIKEN Center for Sustainable Resource Science, Japan. Junjun Qiu, Obstetrics and Gynecology Hospital of Fudan University, China. Paula Sabbo Bernado, Brazilian National Cancer Institute, Brazil. OMICS International acknowledges all the Organizing Committee Members, Moderator, Chair and Editorial Board Members of OMICS group Journals, Speakers, Students, Delegates and Media Partners in making this event a great success. We are also obliged to various government authorities, company representatives and other eminent personalities who supported the conference by facilitating active discussion forums. We sincerely thank the Organizing Committee Members, for their gracious presence, support and assistance. After the immense and grand response received from Chemotherapy-2015, OMICS International proudly announces the 2nd International Conference on Antimicrobial Agents and Chemotherapy, June 04-06, 2016, Dallas, USA. 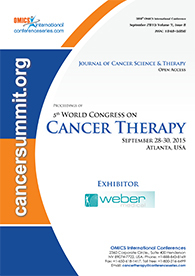 OMICS Group’s 4th World Congress on Cancer Science & Therapy was held during October 20-22, 2014 at DoubleTree by Hilton Hotel Chicago - North Shore Conference Center, Chicago, USA. 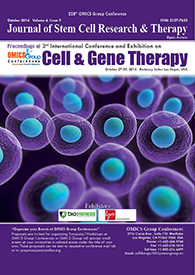 Generous response and active participation was received from the Editorial Board Members of OMICS Group Journals, scientists, researchers, as well as experts in the cancer research, leaders from the fields of Cancer Therapy, and students from diverse groups, who made this conference one of the most successful and productive events in 2014 from OMICS Group. This annual conference brought together eminent experts from different countries in which many modern issues were discussed in depth to provide up-to-date information to the world. On the other hand, the meeting provided a good platform to share their ideas and experiences in the field of cancer therapy. The conference was greeted by the welcome message by our moderators Juan Jose Marugan, National Institutes of Health, USA and Bernard Friedenson, University of Illinois, USA, and welcomed Honorable guests Sudhakar Akul Yakkanti, SRI International, USA,Anupam Bishayee, California Northstate University, USA, and Reza Hakkak, University of Arkansas for Medical Sciences, USA. We sincerely acknowledge all the organizing committee members, moderators, chair and co-chairs, editorial board members, speakers, delegates for their gracious presence, and support in making this event successful. OMICS Group has taken the privilege of felicitating Cancer Science-2014 Organizing Committee Members, Editorial Board Members and Keynote Speakers who supported for the success of this event. OMICS Group, on behalf of the conference exhibitors congratulates the Best Poster awardees for their outstanding performance in the field of Cancer Science & Therapy and appreciates all the participants who put their efforts in poster presentations and sincerely wishes them success in future endeavors. The esteemed guests, Keynote speakers, well-known researchers and delegates shared their innovative research and vast experience through their fabulous presentations at the podium of grand Cancer Science-2014. We are glad to inform that all accepted abstracts for the conference have been indexed in OMICS Group Journal of Cancer Science & Therapy andJournal of Carcinogenesis & Mutagenesis as a special issue. Basing on the conference theme, "Enhanced diagnosis, treatment and management of different cancers”, the speakers recommended organizing the conference in the field of Cancer Science and Therapy in the coming years also. We are obliged to various experts, company representatives and other eminent personalities who supported the conference by facilitating active discussion forums. We sincerely thank the Organizing Committee Members for their gracious presence, support, and assistance towards the success of Cancer Science-2014. With the unique feedback from the conference. 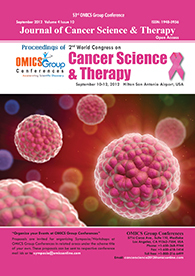 The 3rd World Congress on Cancer Science & Therapy was organized by OMICS Group Inc., during October 21-23, 2013 at Double Tree by Hilton Hotel San Francisco Airport, USA. Active participation and generous response was received from the Organizing Committee Members, Editorial Board Members of OMICS Group Journals, scientists, researchers, as well as experts in the cancer research, Non-government organizations, and students from diverse groups who made this conference as one of the most successful and productive events in 2013 from OMICS Group. The conference was marked with the attendance of young and brilliant researchers, business delegates and talented student communities representing more than 25 countries, who have driven this event into the path of success. The conference was initiated with a warm welcome note from Honorable guests. The proceedings went through interactive sessions and panel discussions headed by Jimmy T. Efird, Brody School of Medicine, USA; honorable Moderator for the conference. OMICS Group has taken the privilege of felicitating Cancer Science-2013 Organizing Committee, Editorial Board Members and Keynote Speakers who supported for the success of this event. OMICS Group, on behalf of the conference exhibitors congratulates the Best Poster awardees for their outstanding performance in the field of Cancer Science & Therapy and appreciates all the participants who put their efforts in poster presentations and sincerely wishes them success in future endeavors. The esteemed guests, Keynote speakers, well-known researchers and delegates shared their innovative research and vast experience through their fabulous presentations at the podium of grand Cancer Science-2013. We are glad to inform that all accepted abstracts for the conference have been indexed in OMICS Group Journal of Cancer Science & Therapy and Journal of Carcinogenesis & Mutagenesis as a special issue. Basing on the conference theme, "Innovations and Novel Therapeutic Strategies in Cancer Science” speakers recommended organizing the conference in the field of Cancer Science and Therapy also in the next year. We are also obliged to various experts, company representatives and other eminent personalities who supported the conference by facilitating active discussion forums. We sincerely thank the Organizing Committee Members for their gracious presence, support, and assistance towards the success of Cancer Science-2013. With the unique feedback from the conference, OMICS Group would like to announce the commencement of the "4th World Congress on Cancer Science & Therapy" to be held during October 20-22, 2014 at Chicago, USA. OMICS Group organized an International Conference on Radiology and Imaging which was held during August 14-16, 2013 in Holiday Inn Chicago Northshore, USA. The congress was organized with the goal of providing a platform for the future development of the discipline. Generous response and active participation was received from the Editorial Board Members of OMICS Group Journals as well as from scientists, researchers and NIH, students who made this conference as one of the most successful events in 2013 fromOMICS Group. The main theme of this Conference was "An Insight into Advanced Methodologies in Radiology". The conference was initiated with a series of invited lectures delivered by both Honorable Guests and members of the Keynote forum. Dr. David Cheng, Yale University, USA, acted as a moderator and helped in making this conference a huge success.